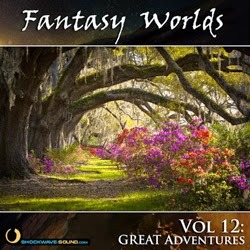 At Shockwave-Sound.com we would like to start off 2015 by announcing a fantastic new release; the music collection Fantasy Worlds Vol. 12: Great Adventures. This wonderful collection features 14 cinematic tracks with a full orchestral sound, composed and produced exclusively for Shockwave-Sound.com by award winning composer, Jason Cullimore (Canada). Through these 14 amazing tracks, Jason takes us to wonderful worlds and baffling discoveries. This music will go really well with family adventure movies, exploration and discovery of amazing places, adventure and fantasy games, and more. As with all of our music collections, each track can also be licensed individually. Just search for each track title in the quick-search box on the site, and the track will come in the search result. This music is available for immediate licensing, for royalty-free use in such projects as games and apps, TV and film, broadcasting and more.